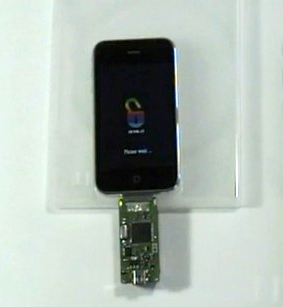 The iDongle is a small piece of hardware that was designed to connect to your "tethered boot" device so that you can reboot on the go without having to connect to a computer. If you have an iPhone 3GS made after week 40 (check the 4th and 5th digits of the serial number), an iPod Touch 2G whose serial number starts with "MC" or an iPod Touch 3G, then you know what an inconvenience it can be at the moment you have to reboot your device. Right now, the iDongle is only being developed for the firmware 3.1.2 but a solution for the 3.1.3 firmware may be developed also if possible. According to the My Boyfriend Is A Geek Blog there are about 12 prototypes of the device. You can visit the page and make a donation to help get manufacturing going. Reportedly, your donation will be deducted from the cost of the device once produced in quantities.